Fall is my favorite season to bake! 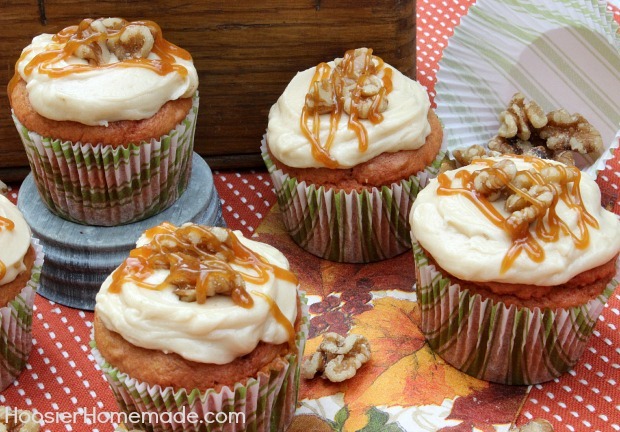 With all the delicious flavors to enjoy – pumpkin, cinnamon, apples, caramel and more – how can you wrong? 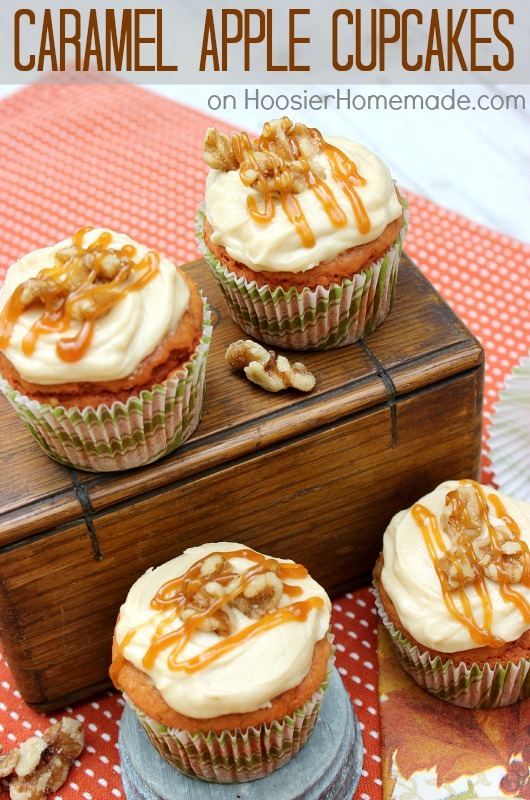 These Caramel Apple Cupcakes start with a doctored cake mix, then stuffed with apples, and topped with a Caramel Frosting, a sprinkle of walnuts and drizzle with caramel these cupcakes are the perfect Fall treat. There’s nothing quite like caramel and apple combination for Fall. One of our favorite family activities in the Fall is to visit the apple orchard and pick a big bag. Next to Christmas, this is my favorite time of year to bake. There are many different ways to fill a cupcake. We learned how to core and fill cupcakes during Cupcake Boot Camp. 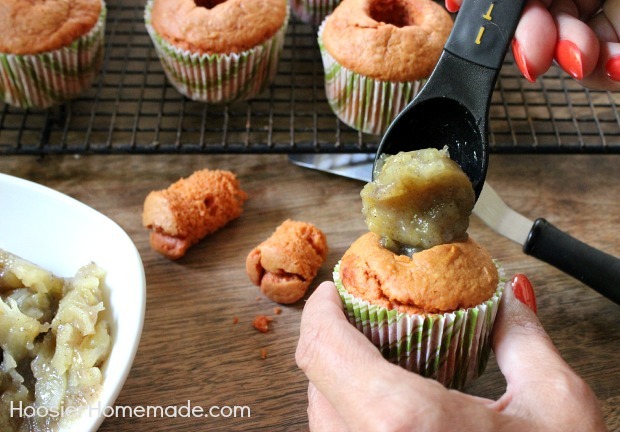 After the center was removed I filled the cupcakes with chopped Fried Apples. 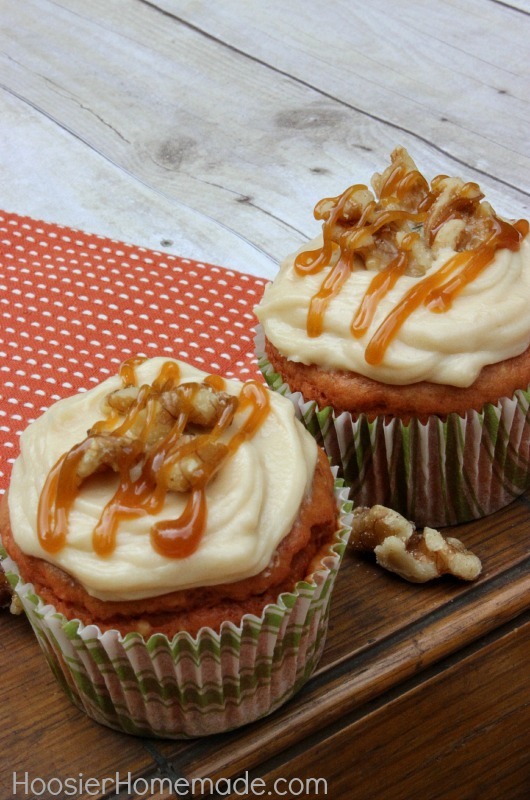 A big dollop of Caramel Frosting, then walnuts and drizzle of caramel finishes off the cupcakes. 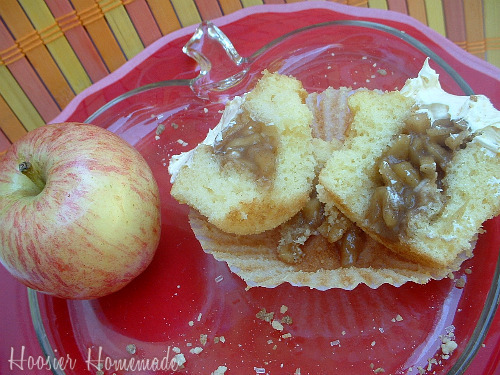 Start with yellow cake, apple pie filling, and caramel and end up with Caramel Apple Cupcakes from HoosierHomemade.com. Combine all ingredients, except cornstarch in a saucepan. Heat over medium heat, bring to boil then reduce heat and simmer until mixture is thick. Add cornstarch (if needed to thicken) and whisk well. 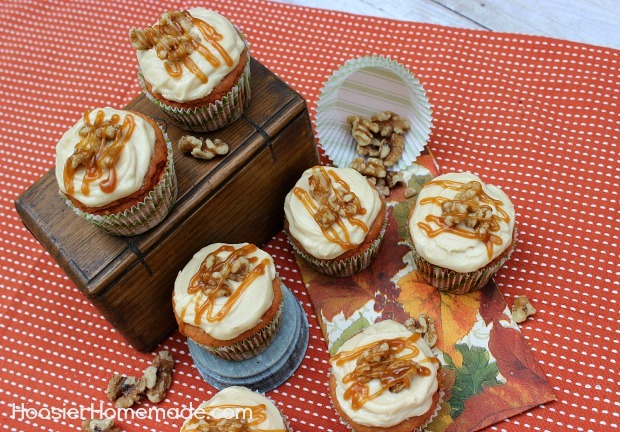 All of the recipes I found for Caramel Buttercream, used cooked caramel. Which is great, but I happen to be in a hurry the day I made these, so I just made my usual Buttercream Frosting and added some Caramel Ice Cream Topping for flavor. It was very good. I also made these before I made the Caramel Sauce that I used on the Caramel Apple S’Mores . You could also use the same recipe and just add it to Buttercream for the flavor. 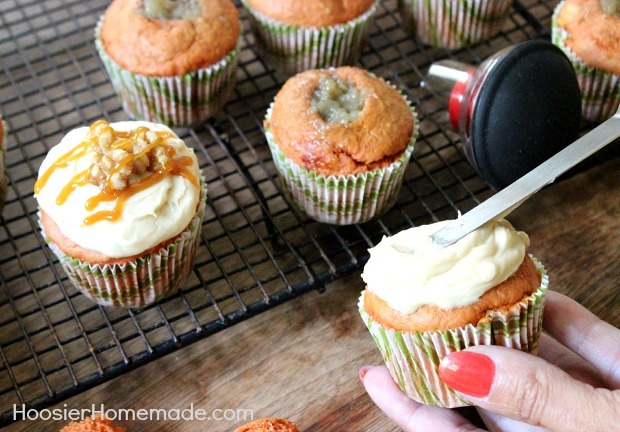 I use an apple corer, most of the time, when I fill cupcakes . After cupcakes are filled, frost with Caramel Buttercream (or regular Buttercream if you want) drizzle with caramel and sprinkle with Caramel Bits . Thanks so much Melissa! So glad you like them! These look absolutely incredible! Adding this recipe to my holiday baking lineup! So glad you like them Kelly! Thanks for stopping by!